We are pretty excited about the COGO enhancements in Release 1. They give you the opportunity to say “Yes” to whatever walks through your door. We took a look at each COGO routine and where ever possible, expanded the routine to use whatever distance / direction types you select. The Intersect dialog shown here is a great example. Because we are creating a geodetic center section per the PLSS, we’ve set both the Distance and Direction types to their PLSS options. Now if we enter a bearing, pick it from a line in a drawing or enter an equation like 540500..540400, we will get True Bearings using mean course convergence. Pretty neat. Don’t do PLSS, then what about select a ground distance type and computing an intersection using ground distances instead of grid. Or what about cutting a 2 acre parcel out of a larger one. Don’t you want 2.00 acres at ground distance (or grid if you are using a local grid for your survey)? Of course you do, and now you can. We can’t think of a single user that won’t appreciate the flexibility this provides in all the COGO dialogs. As we continue to move into GPS and GIS, it’s increasingly important to distinguish between grid and ground in just about everything we do. We can’t think of an easier way to accomplish that in COGO than the way TPC does it. Just pick the Distance and Direction types you want and TPC does the rest. Now that TPC let’s keep track of distance and direction types within COGO dialogs, we know you would want a quick and easy way to set them. So starting in TPC Desktop 2014, R1, if you open a COGO dialog from a traverse, the COGO dialog switches to the distance and direction type of the traverse. Here’s an example using the Stations dialog. 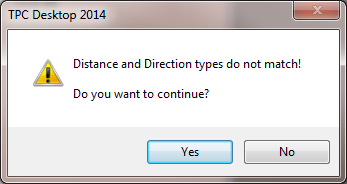 You don’t have options to select the distance and direction types in this dialog because this COGO routine is tied to a traverse, and the traverse can supply them. In this example, we are stationing a traverse named ‘Tangents’. 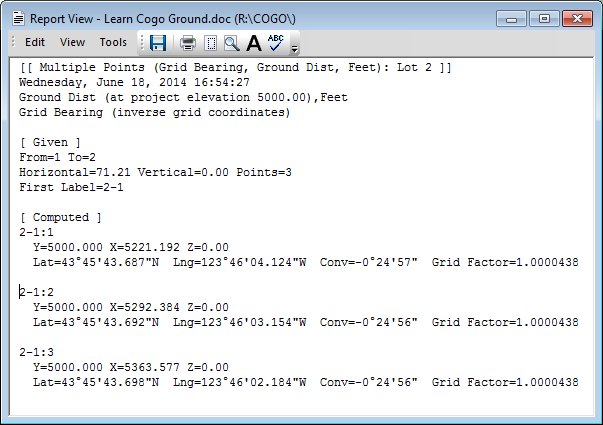 The traverse is set to Grid Bearing and Ground Distance (at project elevation), so those same distance and direction types are used to format the dialog. This is the most intuitive way you can do traverse related COGO like stations, right-of-way offsets, offsets to alignments, predetermined area and others. Want to have your cake and eat it too? Just open any COGO routine from the TPC Desktop and TPC uses the survey’s default distance and direction types instead. 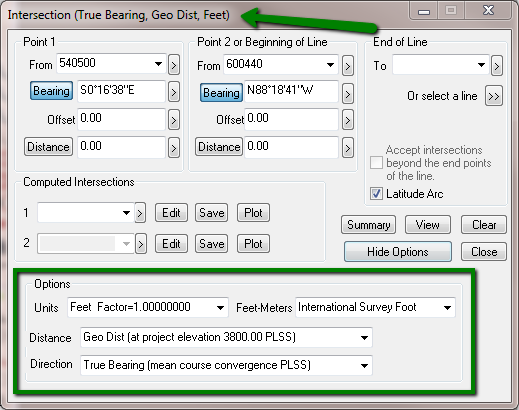 So if you are working in a PLSS survey, all COGO dialogs come up with PLSS distance and direction types. 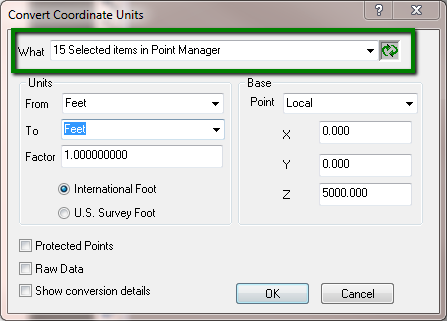 Or set your survey’s default distance type to ground distance at project elevation and all your COGO routines will use ground distance at project elevation. So now that TPC lets you select the distance and direction types to use for a COGO routine, the last thing you want to do is accidently mix a geodetic direction with a grid distance, or any other combination that could spell disaster. TPC understands how critical a mistake like this could be, so we’ve put some pretty obvious safeguards in place for you. Just start a COGO routine from a traverse that has mismatched types and this is what you will get. TPC warns you that the types don’t match, then let’s you decide if you want to continue. If that’s what you want and you know what you’re doing, go right ahead. If not, go back and correct the traverse types and try it again. Summary – if you continue the COGO routine with mismatched types, TPC includes a line in the Summary output to the current report. Here’s the start of an intersection report with mismatched types Notice how TPC tells you what each type is, then wans you that they don’t match. Warning: Distance and Direction types do not match! For some COGO routines, like Random Inverse, TPC doesn’t require that distance and direction types match, so you won’t get a mismatch prompt or warning. TPC understands that you may need to check an inverse from someone else’s survey in which proper care wasn’t taken to keep grid / ground / geodetic straight. In that case, you may need to mix-n-match types to reproduce their numbers. The great thing is, you’ll then know exactly what they did and didn’t do in that prior survey. All COGO dialogs now include a Summary button that adds everything about what you just did to the current report. In this example, we inserted 3 points on the lot line between point 1 and 2. From the Summary, we know that we are working with ground distance and that we inserted 3 points between existing points 1 and 2. We also know that the average distance between points is 71.21 feet. But that’s not all. We see the 3 points that were computed and added to the Lot 2 traverse. If we were then to choose the Undo button in the dialog, these are the 3 points that would be removed from the survey. Most COGO dialogs now include a Clear button. It’s a pretty simple luxury that let’s you start over and enter an entirely new set of data. A number of COGO dialogs automatically compute their data as soon as you enter enough information. The Random Inverse dialog is a good example of this. As soon as you recall two points to inverse, TPC computes the inverse and fills out the fields in the dialog. You’ve always been able to update the dialog by re-entering any piece of data. Now you can also just choose Recompute. Adding Compute and Recompute buttons means you can also Undo. Undo has been added to most of the COGO tools. We expanded point relabeling to use the now familiar What list. Just tell TPC what data you want to relabel, give it a starting label and choose Compute. 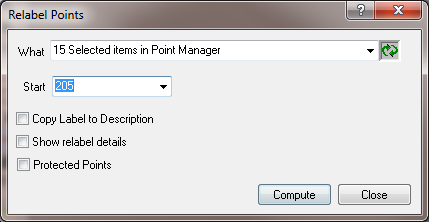 In this example, we’ve selected 15 points in the Points Manager. You can now choose to relabel all the points in a traverse, just selected points in a traverse, selected points in the Points Manager and, well, you get it – whatever you choose to relabel. You can now enter a starting point label and TPC will search the database, giving you options to use the next point label larger than the one you entered or create a unique point label based on what you entered. Adding the Compute button means you can also Undo. Let TPC relabel the points and if you don’t get what you want, just Undo. TPC also gives you the option to list the relabeled points in the current report. Keep track of exactly what point got relabeled to what. When you protect points in TPC, you can protect just the coordinates and elevation or everything – the choice is yours. So if you only protected a point’s coordinates, TPC is free to update it’s label. If you protected everything for a point, TPC only updates the label if you turn on [x] Protected Points. And if TPC can’t relabel a point because it’s label is protected, it tells you that in the Message View. TPC has supported ellipses for a long time via CAD import and when drawing error ellipses for our Least Squares analysis. Now we’ve added an ellipse tool to the drawing view so you can draw and edit them yourselves. You can now draw ellipses, just like you draw circles and rectangles. 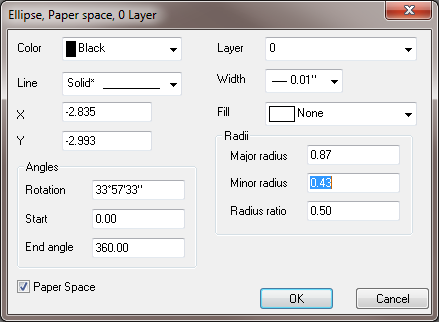 Just choose the Insert, Ellipse command in the Drawing View. Select your insert point and major-axis angle, then just click the end of the major-axis. TPC uses the default axis ratio to draw the ellipse. Once it’s drawn, just edit the ellipse to change anything about it you want to. Here’s the Properties dialog for an ellipse. Notice the Radius ratio of 0.5. Change it to whatever you want or just re-enter the major-axis or minor-axis you want. 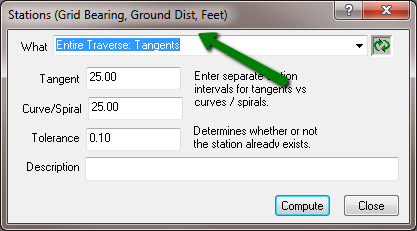 This release provides added flexibility in converting coordinate units by adding the What list to the Convert Coordinate Units dialog. In TPC Desktop 2014, we introduces the ability to include drawing variables anywhere within drawing text. We’ve expanded this option in release 1, optimizing the way TPC handles variables to make drawing with them even faster. We also included AutoCAD 2015 drivers. To get TPC Desktop 2014 Release 1, you must be on the TPC Connection. We will continue to maintain Release 0 (February 2014) for those who are not on the TPC Connection.